SC Johnson’s Administration Building isn’t just inspiring. It’s the last operational Frank Lloyd Wright-designed corporate headquarters. “Anybody can build a typical building. I wanted to build the best office building in the world.” – H.F. Johnson, Jr. 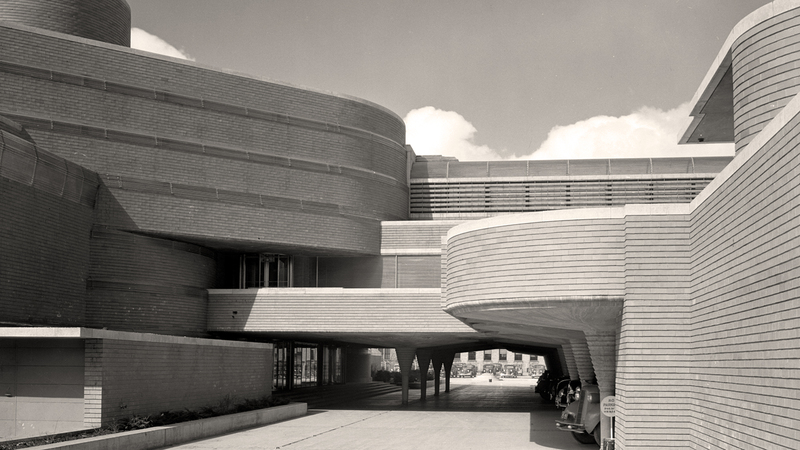 In 1936, third-generation SC Johnson leader H.F. Johnson, Jr. sought out the architect Frank Lloyd Wright. Even though ground had been broken for a new administrative office, H.F. wanted to explore a more modern approach. And he wanted it enough to scrap the old plans and take a risk on the innovative Wright. He later explained, “Anybody can build a typical building. I wanted to build the best office building in the world, and the only way to do that was to get the greatest architect in the world.” So began a relationship between H.F. and Wright that would endure for decades. 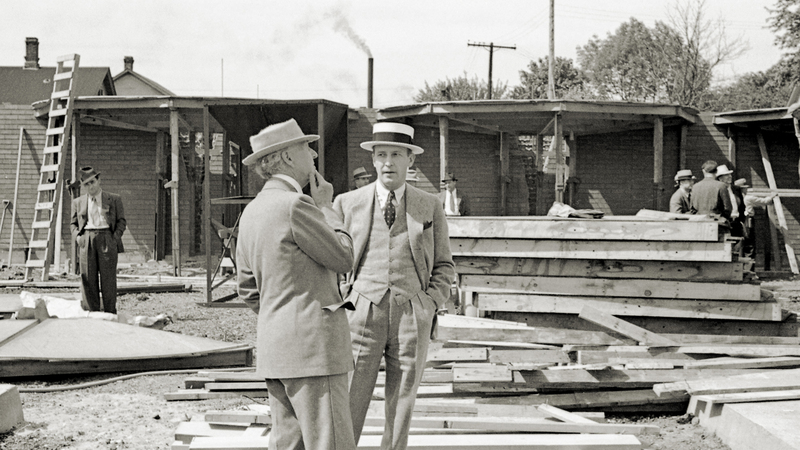 H.F. Johnson, Jr. (right) and Frank Lloyd Wright, at the Administration Building construction site, 1937. From the 43 miles of glass Pyrex tubing that forms its windows, to the soaring columns in its Great Workroom, our Administration Building is a truly unique place to work. 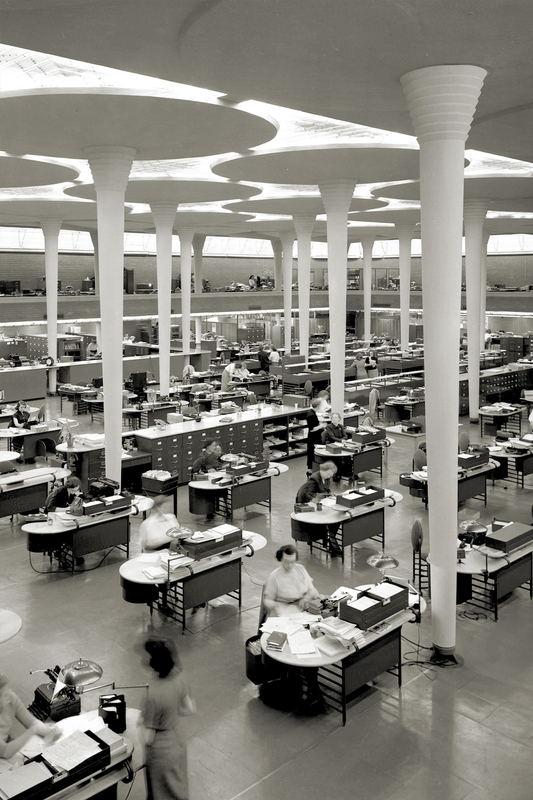 It’s also the only corporate headquarters that Frank Lloyd Wright designed that remains operational. The building, which opened in 1939 in Racine, Wisconsin, is celebrated as one of the top 25 buildings of the 20th century. 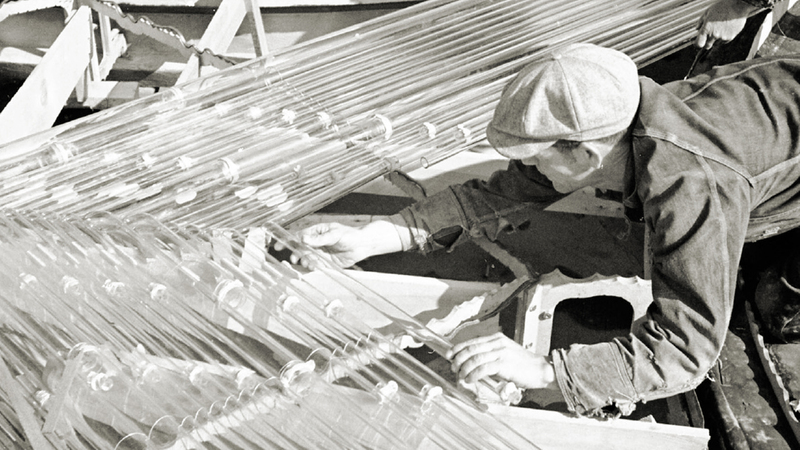 We like to think it reflects the innovation, boldness and adventure that are still the spirit of SC Johnson today. Decades ahead of his time, Wright employed innovative modular furniture and an open office plan to make the workspace more productive. The Administration Building also was one of the first in the United States to be completely air-conditioned. Perhaps the most recognized feature of the Administration Building’s Great Workroom is its columns. Wright called them "dendriform," meaning tree-shaped, but many also refer to them as lily pads because of the unique shape of their top supporting pads. The columns are just 9 inches in diameter at their base, but blossom to 18.5 feet in diameter at the top. Despite their beauty, not everyone shared Wright’s optimism that the columns were a good idea. Initially, the Wisconsin Industrial Commission refused to approve the building plans, saying that they believed the design of the columns to be unrealistic. Wright, however, was not deterred. 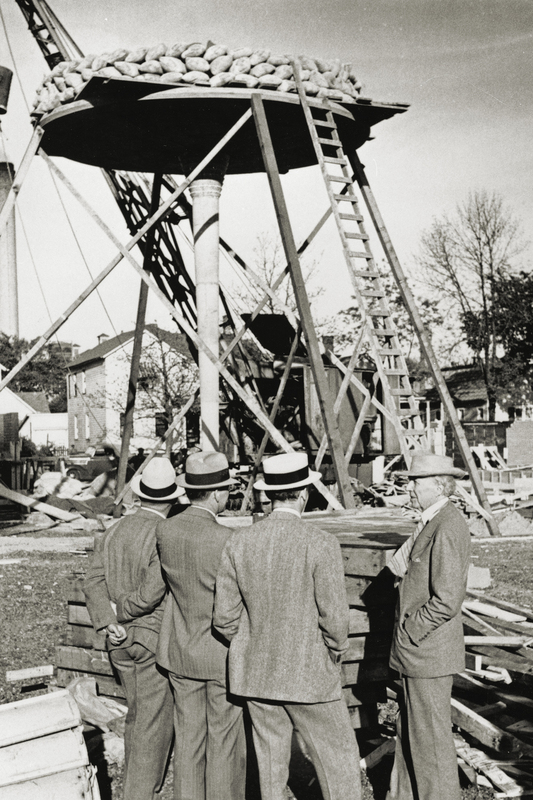 In 1937, he oversaw a structural integrity experiment. 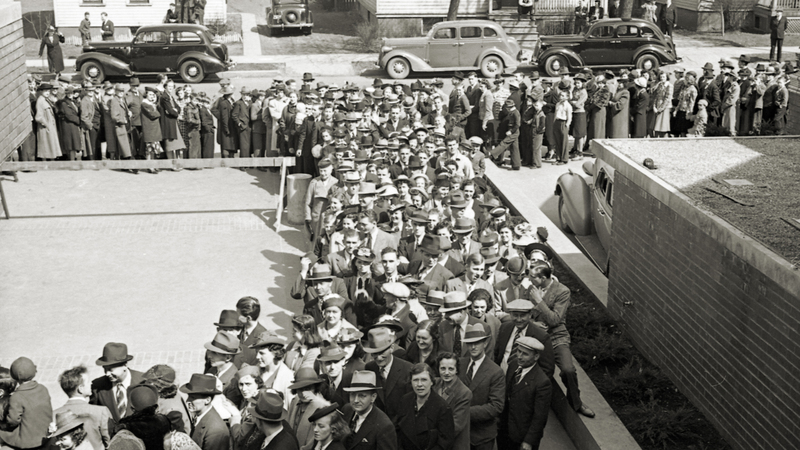 Hundreds of onlookers and H.F. himself gathered to watch the dramatic field test. In the end, the columns proved their worth. They withstood a load of sixty tons – ten times the required amount. The construction was approved. LEFT : When the Administration Building columns held ten times the required load in a structural test, construction was approved. RIGHT : The completed columns soar throughout the one-half acre Great Workroom, a forest of creativity and inspiration. TOP : When the Administration Building columns held ten times the required load in a structural test, construction was approved. BOTTOM : The completed columns soar throughout the one-half acre Great Workroom, a forest of creativity and inspiration. Wright’s focus was not just the structure itself. He planned more than 40 different pieces of furniture for the Administration Building. 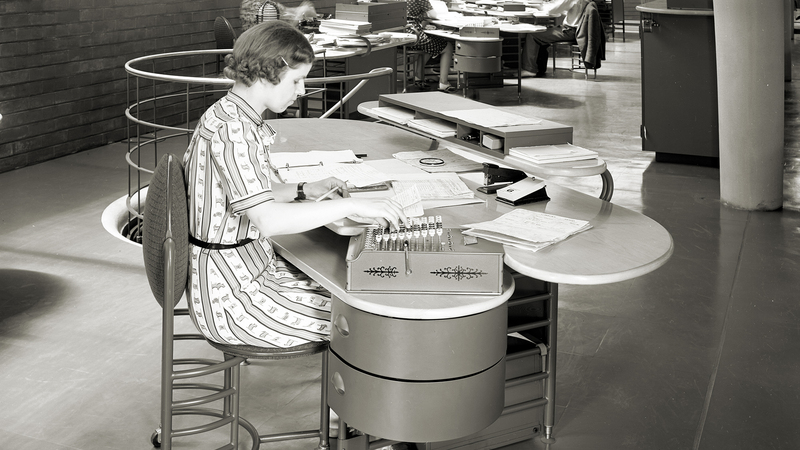 Each was created to reflect aspects of the building's unique design and to help get work done – for example, rolling file carts that could be moved easily around the Great Workroom. Open “bird cage” circular elevators run from the basement to the Penthouse level, giving a panoramic view of the building. He also identified a warm red-brown shade, known as “Cherokee Red,” for both exterior and interior walls. Most brick buildings use just a few brick shapes – one could say the buildings are designed to fit the brick. In the Administration Building, on the other hand, the brick was designed to fit the building. Nearly 200 special shapes of Cherokee Red brick were created, including interior and exterior radii, interior and exterior radius corner brick, and other special shapes. The trim is Kasota Stone of a color that complements the bricks, and the mortar in the horizontal joints is raked out to give the entire building a flowing, streamlined effect. Nearly 200 special brick shapes were created to achieve the curves Wright envisioned. Wright designed more than 40 pieces of custom furniture for SC Johnson. The opening weekend, 26,000 people toured the new Administration Building. And, indeed, it did just what H.F. and Wright intended: It set the company apart and brought huge attention to us as a unique business. Life Magazine touted the Administration Building as the shape of things to come, comparing it to the futuristic buildings featured at the 1939 World’s Fair in New York. We hope you’ll visit to experience the Administration Building yourself! Tours of our global headquarters and Frank Lloyd Wright-designed campus are free and open to the public with advance reservations. Book your spot for a tour, and stay to see our Academy Award-winning film. We think you’ll find your visit as inspiring today as it was to all those visitors decades ago. Great design never gets old.